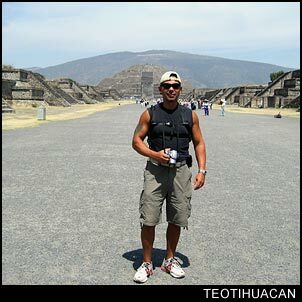 Teotihuacan is located about 31 miles North East of Mexico City. So if you plan on going to Mexico City, this is a must see sight. 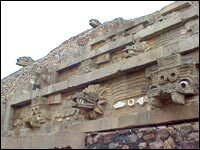 The rise and fall of Teotihuacan coincide roughly with the rise and fall of the Roman Empire beginning around 500 BC, and going into decline around 650 AD before the city was sacked, burnt, and abandoned. The empire grew by leaps and bounds between the 1st and 4th centuries AD and its influence stretched from Guatamala to Texas. The population within the city itself grew to over 200,000 people, and Its power and glory were not to be matched by any civilization (including Rome) existing on the earth at that time. Teotihuacan is unique in the fact that the murals uncovered here do not depict the thematic violence or ritualistic sacrifices found in other ceremonial cites, they portray a society which seemed to be interested more in astronomy, and the benevolent Quetzalcoatl, represented by the plumed serpent. -- On a side note, I noticed that the artwork in Monte Alban near Oaxaca shows a very distinct shift from what could only be classified as peaceful or family oriented to blood thirsty around the fourth century. My personal opinion is that the areas under the influence of Teotihuacan's Empire were also peaceful between the 1st and 3rd centuries, but that a blood thirsty warrior people took one city after another beginning in the south and slowly moved northward eroding the power base of Teotihuacan's Empire and causing strife within the empire which many would have felt was unable to protect them. The conquering power would then begin a propaganda campaign with the construction of new facades on conquered cities depicting their victories and reinforcing traditions of ritualistic sacrifices of their enemies. 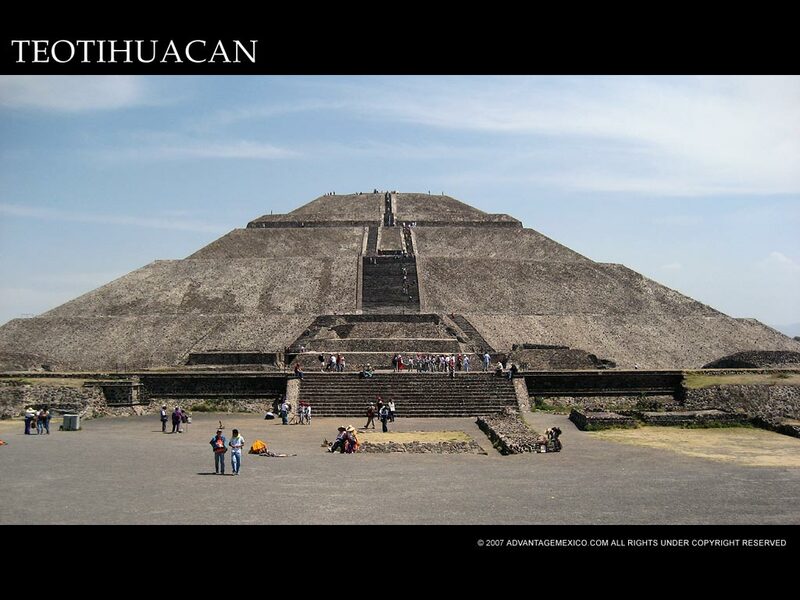 The Pyramid of the Sun at Teotihuacan was built in the first century AD. It has a base ten feet shorter (on each side) than the Great Pyramid of Cheops, and a volume of 2.5 million tones of stone and earth used in its construction. The alignment of this pyramid was designed to coincide with the two days a year (May 19th and July 25th) when the Sun would be directly over the top of the pyramid at noon. The East facade directly faces the rising Sun, and the West facade directly faces the Sun as it sets. In 1971 archeologists stumbled across a clover leaf shaped cave (closed to the public) believed to have been formed by a subterranean spring. Speculation abounds about this area being used as some kind of inner sanctuary or sacred place. The Pyramid of the moon at Teotihuacan appears to be as tall as the Pyramid of the Sun due to the fact that it is built on higher ground. This pyramid was built slightly later than the Pyramid of the Sun, perhaps around the time the first was finished. 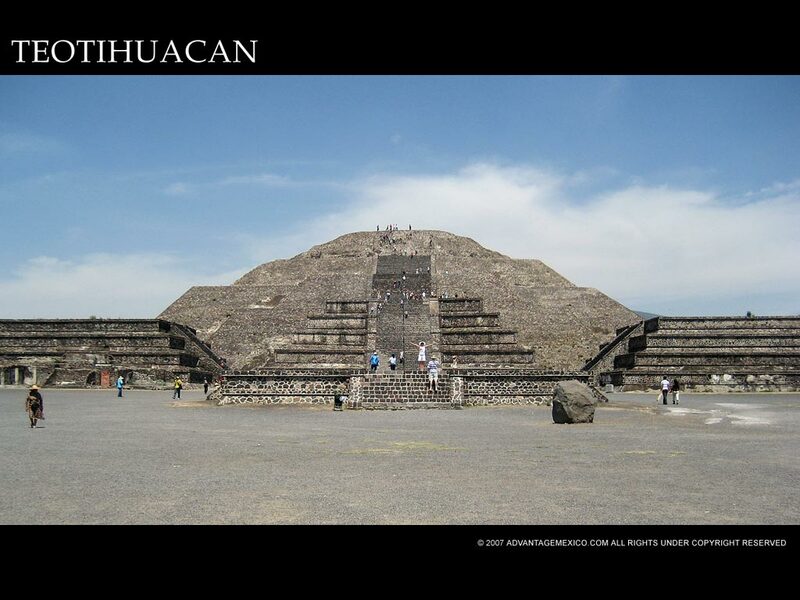 The top of the Pyramid of the Moon provides the best overall view of Teotihuacan. The sight of the ruins stretching both sides of the mile long Avenue of the Dead opens ones eyes to how truly great this city once was. Directly across from the main entrance to Teotihuacan lies the Citadel. At first glance, this sunken square appears to be quite inferior to the larger pyramids at the other end of the Avenue of the Dead. Looks, however, can be deceiving. Take a walk around to the back side of the pyramid where the facade of a newer pyramid has been demolished, and you will find an amazing peek into the pyramid underneath built between 1 and 350 AD. 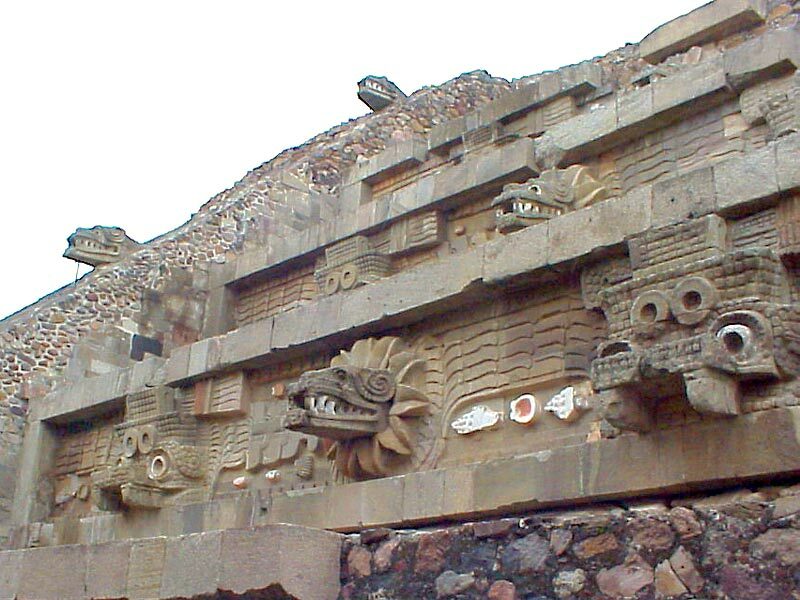 The temple has images of Tlaloc (believed to have been a rain god) and Quetzalcoatl from which the temple receives its name.